BCD-105: River Tubing + Bali Bathing Elephant. On this Adventure Bali Package, we will take you to experience one of the most exciting program from us, Washing + Bathing at pool + feeding + riding and enjoy lovely breakfast at Mason Adventure Park, then you can choose one from three river tubing that we have in Bali, Please contact directly us for the best information before booking. Early morning drive from you hotel, please bring swim wear or short and extra dry cloth as we will get wet on Bathing elephant program as Mason Adventure Park Taro village, brushing our elephant by your hand, then bathing at swimming pool, feed them and ride them for 30 minutes, and enjoy morning breakfast at our cozy restaurant while see the elephant park with the pool… its wonderful day experience if you book this trip with Bali Cab Driver booking center. After ride, then….. are you ready for the adventure thrilling tubing in Bali ? Join on our afternoon tubing, we offer 3 river option; Number 1 is Ayung river tubing for adventurer and challenges one which is take 2,5-3 hours trip along ayung river rapid, this adventure only for adult one. Number 2 is Pakerisan river loacted at Tampak Siring, where we can enjoy the Adventure Tubing, Tracing the Authenticity Pakerisan river along 4.5 km for 1,5 hours trip, Enjoy the river water is sourced from springs Saints, Clear and Fresh, River class II+ rapids , charming curves Rivers, take bath at natural water spring fountain. Even child from 5 years can joined the adventure and child can do tandem tubing with parents. Number 3 is Penet river Tubing located at Tanah Wuuk near Sangeh Monkey forest, experience an unforgettable journey, floating and riding the waves for 3.5 km, taking approximately 1.5 – 2 hours. With nature and green lush vegetation, drifting in the river and its unexpected wild waters and waterfalls, stop at Waterfall and take a bath at natural Water spring fountain, child from 5 years can join us on single tubing. After tubing adventure, take shower and changes then take your time to enjoy the lunch. BCD-105: River Tubing +Bali Bathing Elephant. 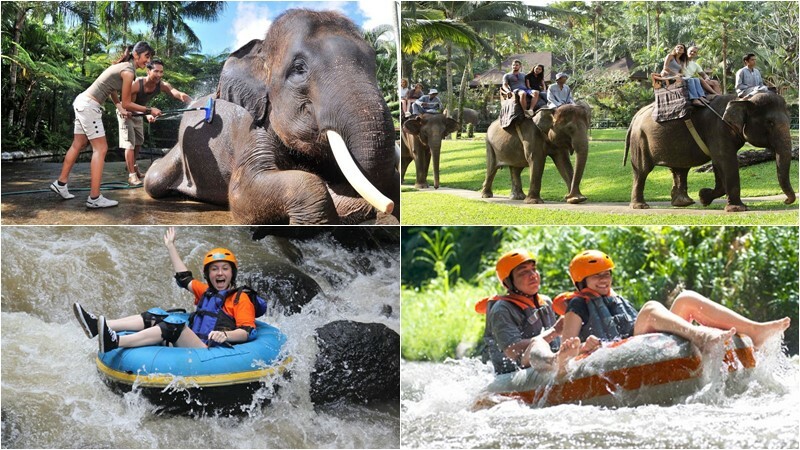 Option 1: Ayung River Tubing + Bali Bathing Elephant. 07.30 – Arriving at Mason Elephant Safari Park & Lodge Taro. 08.15 – Shower and changes your cloth. 10.30 – Elephant Ride for 30 minutes. 11.00 – Visiting Museum and Elephant Discovery Information Center. 12.40 – Arrive at Tubing Base Camp, welcome drinks, registration. 13.00 – Transfer to Tubing start point. 13.15 – Arrived at Tubing Start point, outfit the safety equipment, then walk down to river side. 16.30 – Arrived at Finish Point, then walk up back to Tubing Base Camp / Shower and Changes. 17.15 – Enjoy Late Lunch. 18.00 – Transfer back to your hotel. – We have Single and Tandem Tubing. – Tubing at ayung use paddle. Option 2: Pakerisan River Tubing + Bali Bathing Elephant. 15.00 – Arrived at Finish Point, then walk up back to Tubing Base Camp / Shower and Changes. 16.00 – Enjoy Late Lunch. Option 3: Penet River Tubing + Bali Bathing Elephant. 13.15 – Arrive at Tubing Base Camp, welcome drinks, registration, Safety tool outfit + safety talk. 13.45 – Transfer to Tubing start point. 14.00 – Arrived at Tubing Start point, then walk down to river side. 15.45 – Arrived at Finish Point, then walk up back to Tubing Base Camp / Shower and Changes. 16.15 – Enjoy Late Lunch. – We have Single tubing only. If want add 2 hours Spa with extra USD 25/person. Ayung & pakerisan river tubing offer tandem Tubing. Bathing elephant at Mason Elephant park. Tubing ride with all safety tools with guide and insurance. Extra dry cloth 2 pieces. Short or swim wear for tubing.